Modern houses in Brazil are usually vibrant and lively, reflecting the spirit of this culturally rich country. 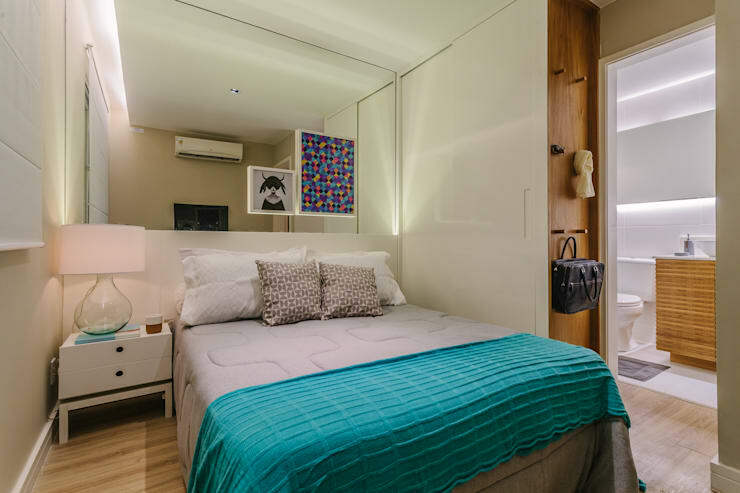 And this small but stylish 62sqm apartment is no different. 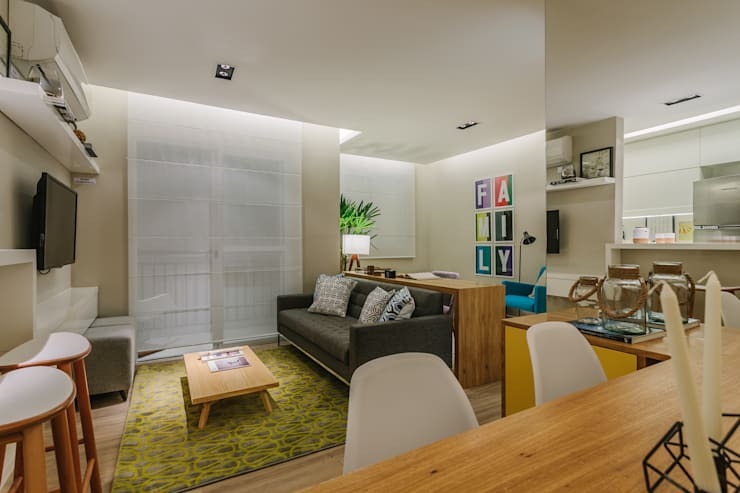 By smartly utilising space and embracing an open plan layout, the interior architects at Studio Leandro Neves have been able to make this flat cosy, functional as well as exciting. Bright hues like yellow, red, blue and green pop up almost everywhere for a cheerful ambiance wherever you go. The furniture is trendy and cosy, while the designs are simple and sleek. 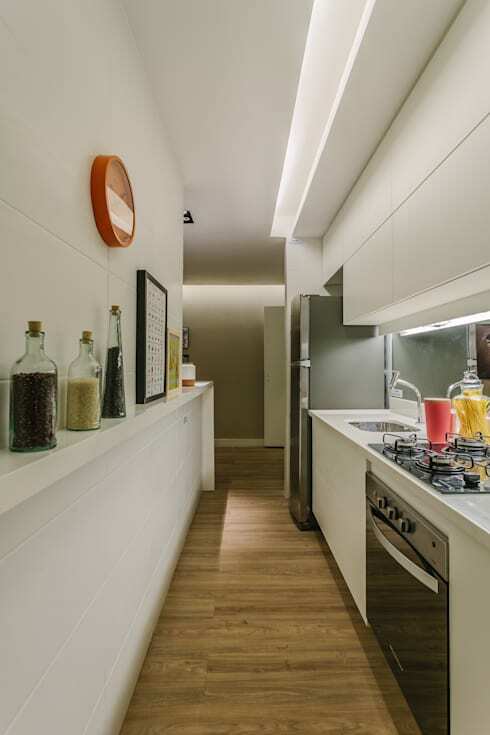 Smart storage solutions and decor accents like mirrors also help in making the residence feel spacious and airy. 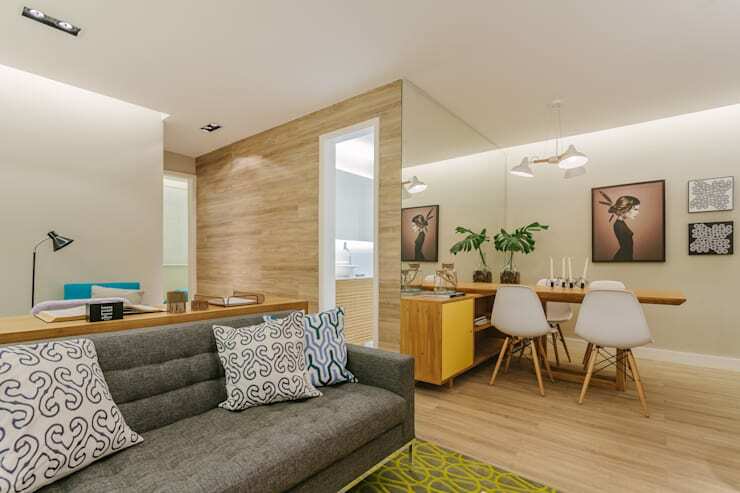 Wooden elements offer warmth, while contemporary lighting livens up the interiors without jarring the eye. 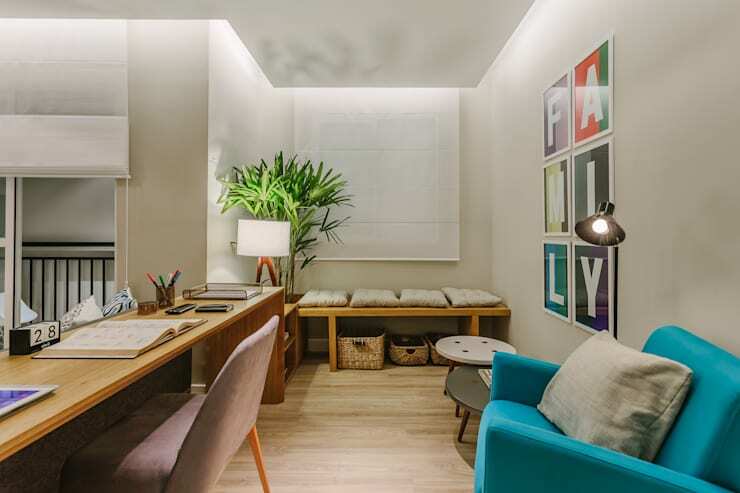 This image clearly shows how the layout of the apartment helps in merging the living, dining and home office effortlessly. Sleek wooden elements, a bright rug and a cosy couch with patterned cushions make the living space very welcoming and soothing. Cove lighting all around the false ceiling bathe all areas in a pleasant glow. From this vantage point, you can see how the wall holding the sleek TV unit has been joined with the bar counter of the open kitchen. A slim shelf right below the air-conditioner helps in displaying photos and knickknacks too. Neat wooden furniture and a lush potted green make this home office or family corner inviting and warm. The space under the bench has been utilised to accommodate charming wicker baskets, while the bright blue armchair makes a lively statement here. The bold and colourful wall art which spells “Family” is a creative touch. A large mirror lends unique style to the minimalist but modish dining space, besides making the home look spacious. The dining furniture is sleek and a mix of wood and white, while some paintings and a potted green add personality to the space. The mostly white kitchen features smooth and minimal cabinets, trendy appliances and ample lighting to make culinary chores easy. The ledge on the left has been cleverly used to store oils, spices as well as artworks. While a massive mirror makes the bedroom appear more spacious than it is, pegs on the wooden wall near the attached bathroom helps in hanging up bags, scarves, belts and more. The bright blue throw adds pizzazz to the otherwise soothing and sober bed, and the lamp makes an elegant statement. 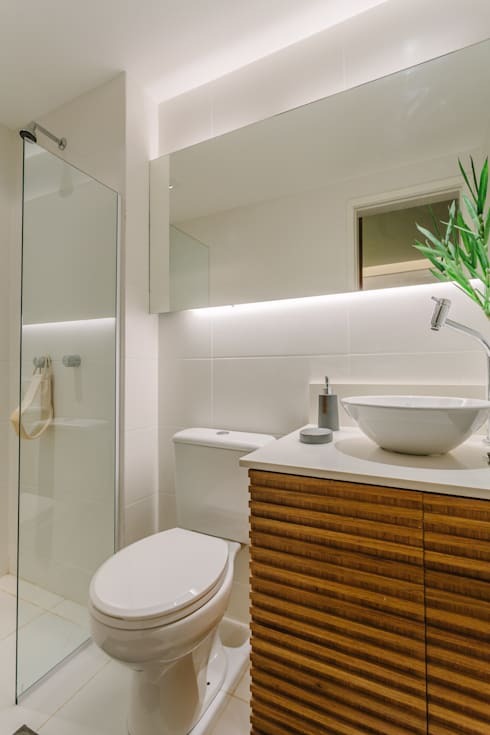 Though small, the wood and white combination of this bathroom looks classy and cosy. A long backlit mirror, fashionable sanitary wares and a transparent glass shower panel ensure an airy and open feel here. 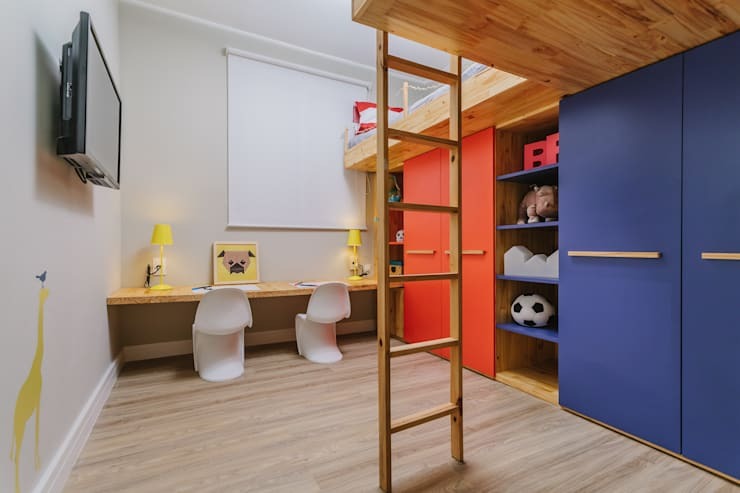 Bold splashes of red and blue along with the warmth of wood make the children’s room lively and playful. 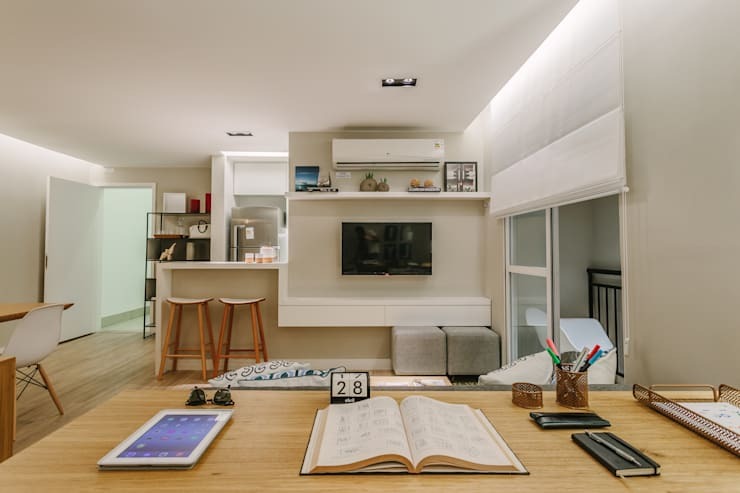 The long wall-mounted desk is accompanied by cute white chairs to make study time fun. We also love how the L-shaped space under the bunk beds have been smartly used to accommodate closets with numerous shelves for storing clothes, toys, books and whatnot.